In this tutorial, I show you how to change eye color in Photoshop using a Hue/Saturation adjustment layer! Whether you know which eye color you need or you just want to play around and experiment, a Hue/Saturation adjustment layer makes changing eye color easy, fast and fun! And because we'll be working with an adjustment layer, we won't make any permanent changes to the image. 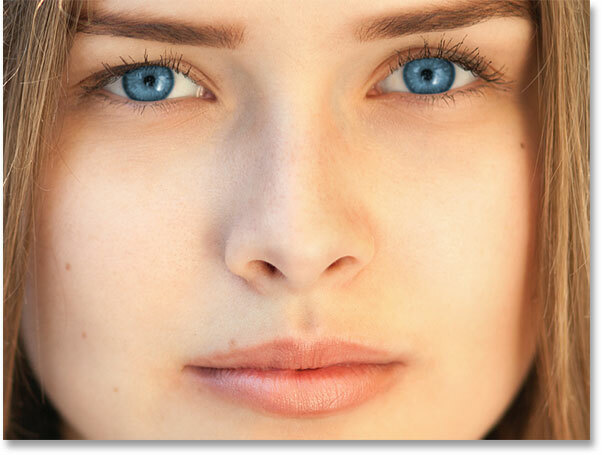 You'll still have your original, unedited version, with the original eye color, even after we're done. 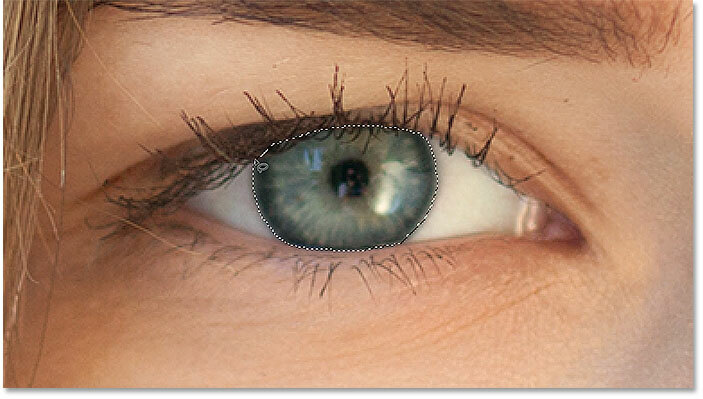 Zooming in on the eyes and centering them on the screen. Press and hold Shift, then draw a selection around the other eye. 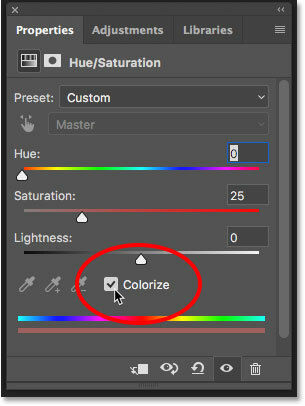 Selecting "Colorize" near the bottom of the Properties panel. 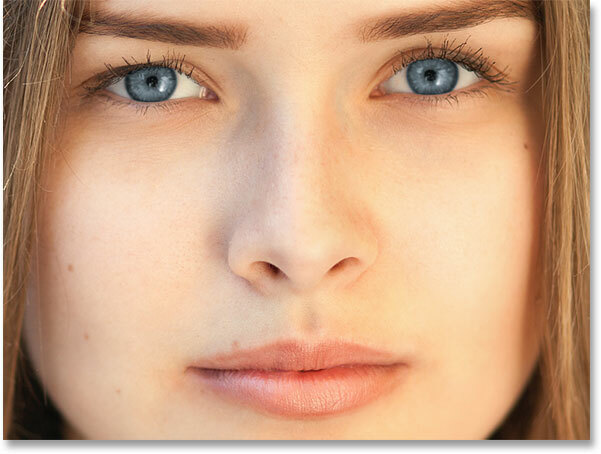 The eyes instantly change color, although red isn't a great choice. Choosing a new eye color by dragging the Hue slider. The result after dragging the Hue slider. 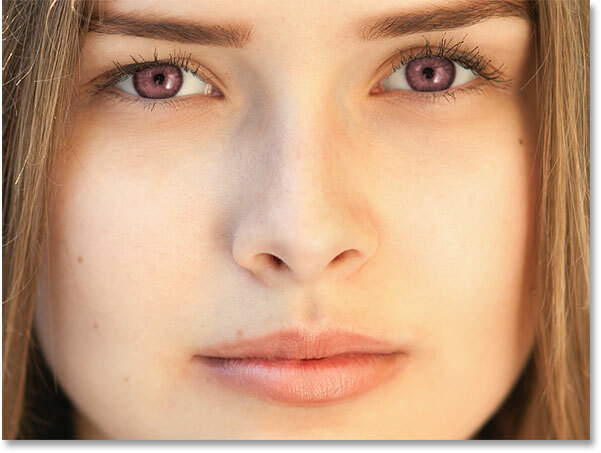 Lowering the saturation of the new eye color. The eye color now looks less intense and more natural. 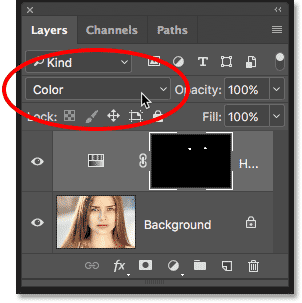 A great feature of adjustment layers in Photoshop is that they include a built-in layer mask, and whether we've known it or not, we've been using the layer mask ever since we added the Hue/Saturation adjustment layer. 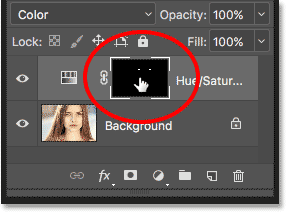 Photoshop used our initial Lasso Tool selection to create the mask for us, and we can see the layer mask thumbnail in the Layers panel. Notice that the thumbnail is filled mostly with black, with only two tiny areas of white. 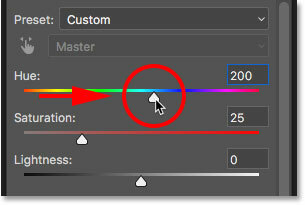 Black represents the areas where the Hue/Saturation adjustment layer is having no effect on the image. In other words, those areas are still showing their original color. 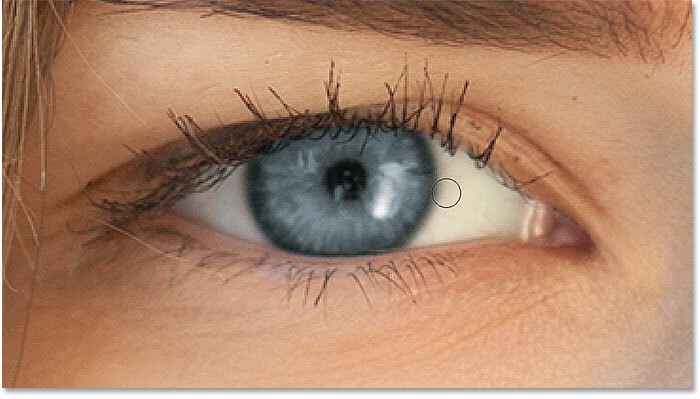 The two small white areas are the selections we made around the eyes with the Lasso Tool. Those are the only areas in the image that are being colorized by the adjustment layer. Making sure the layer mask is selected. Some of the new color extends into the surrounding areas. The Foreground color is now set to black. 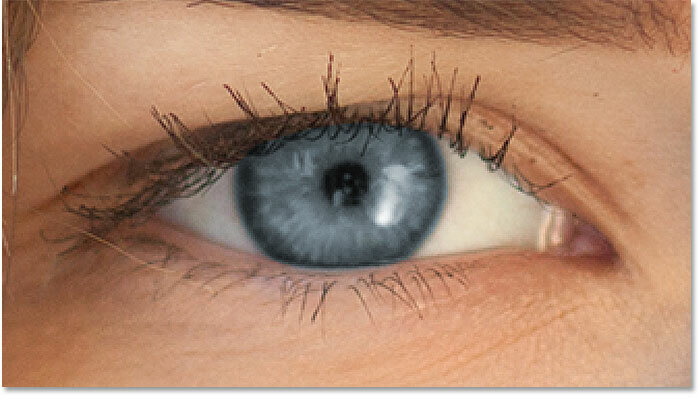 Paint around the iris in each eye to clean up any problem areas. For best results, use a small, soft-edge brush. You can adjust the size of your brush from the keyboard by pressing the left bracket key ( [ ) repeatedly to make the brush smaller or the right bracket key ( ] ) to make it larger. To change the hardness of the brush, press and hold Shift while pressing the left bracket key to make the brush edges softer. Holding Shift while pressing the right bracket key will make the edges harder. Painting with black around the edges of the iris. Painting away the color inside the pupil. If you make a mistake and accidentally paint away some of the color in the iris, press the letter X on your keyboard to swap your Foreground and Background colors. This will set your Foreground color to white. Paint with white over the area to restore the color. Then, press X again to set your Foreground color back to black and continue painting. And there we have it! 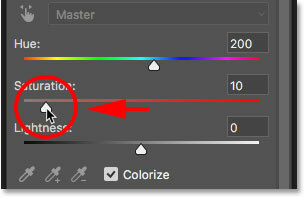 That's how to easily change eye color in an image using a Hue/Saturation adjustment layer in Photoshop! Looking for similar tutorials? 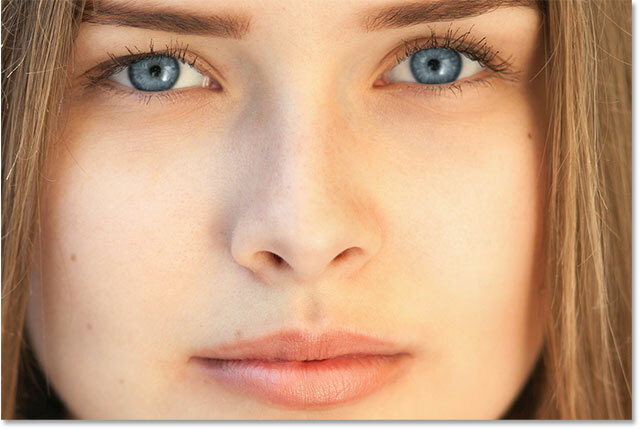 Learn how to lighten and brighten eyes, or try our Radial Zoom Enhanced Eyes effect! 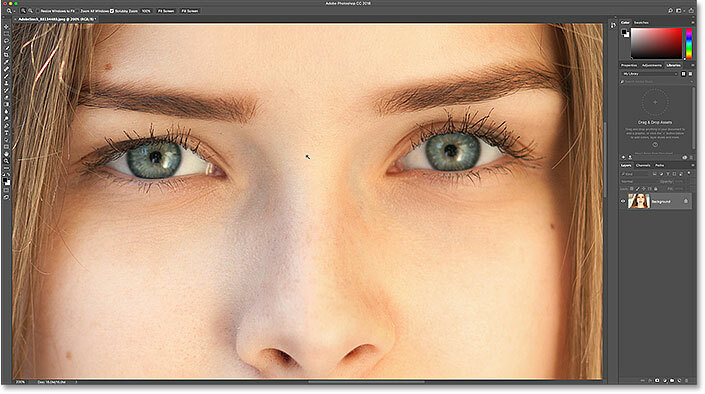 Visit our Photo Retouching section for more image editing tutorials!